Is your backyard that an eye-sore that you want to landscape but do not want the headaches that go with landscaping it? 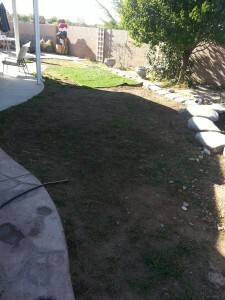 Most people like the green color a lawn will add to their yard which xeriscaping does not provide enough of. If you do decide to plant grass in your backyard the first thing you may consider is water cost, and if you live in New Mexico they are most likely going to be high. The next thing needed is to put in a sprinkler system. Some things you will deal with when putting in a sprinkler system is broken sprinklers, broken valves, constant station adjustments, and winterization. Finally, when you get to plant your grass, it will require fertilization and trimming. If everything is not done properly, your lawn will die and look like this picture (left) with nothing to show for your hard work, time and money. 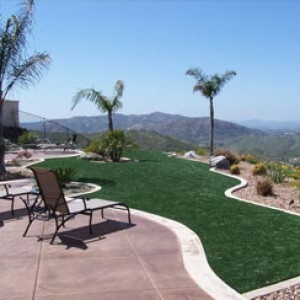 Now consider Southwest Greens synthetic lawn solutions. You can easily transform your backyard into a beautiful landscape without having the worries of ongoing maintenance and high water bills. Imagine walking out your back door after a long day and not have to cringe at your view, but instead when you go to relax on your porch, you can sit in your lounge chair and enjoy the view of your beautiful backyard without the worries maintenance. Give us a call today and we can assist you with designing your beautiful lawn that will require no work or worries on your end. You can have a beautiful backyard no matter what time of the year it is.